Soundbank for the amazing spectral synth iZotope 2. Textured pads, classic pads and organic soundscapes defines the essence of this soundbank. Inspired by the sounds of Mother Earth and pioneers from the early electronic music scene, make sound worlds collide in harmony in this collection. 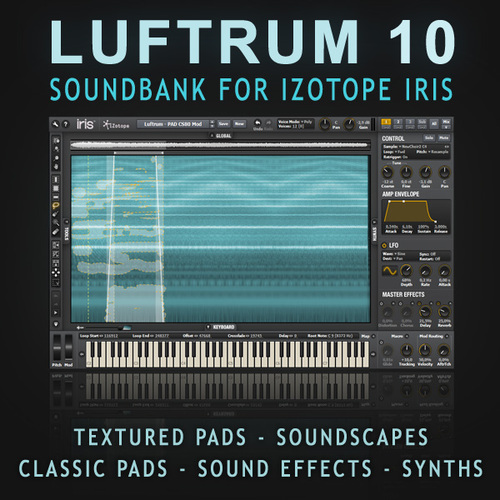 The soundbank makes extensive use of samples from the Luftrum collection. Samples of a didgeridoo, the forest, rain, voices, airport, sound toys, clockworks, record dust, VA synths + a handpicked selection of binaural recordings. Make sure to watch the YouTube demo below by maestro Nicky Bendix taking us on a journey through many of the pads, soundscapes and synths contained in Luftrum 10.